Awards For Ya’ll- Free | Talking to My Weight Loss Counselor-God! Several blog friends have sent me different awards over the last few months and I’ve been very slow in responding. Dear friends, I treasure each award. You honor me and I appreciate your love. I humbly ask your forgiveness. Now I w ant to grant each and every one of you an award with some kisses too. But I’m changing the rules. . . If you read my blog, thank you. If you make comments, I appreciate it. If you share or re-blog my posts, I think I love you. So help yourself to an award too. Just mention my blog link as a favor. You may answer the award questions if you wish. If your schedule is full like mine, just help yourself to the award without answering questions. Enjoy the fact that you are loved and I want to award you. I was nominated for this award by Susie at http://susieshy45.wordpress.com Thank you Susie. It’s so enjoyable reading about your life on the other side of the world. You’re a good friend too. 1.Once you’re nominated, add the picture to your blog. 2. Write a short description about yourself and what your blog means to you. Oh and if you were an animal, which animal would you be? I’m a grandma who after 41 years of failed diets ended up weighing 241 pounds. When I cried out to God in desperation He delivered me with a weight loss of more than 90+ pounds. My blog has served as a diversion to my worst hobby-eating. It’s connected me with many wonderful friends across the world. If I were an animal, I probably would be a “stuffed” animal because most of my life I have been stuffed. LOL! Thank you so much Hilda (http://fittoservegroup.com ) for nominating me for this a ward. I’m honored to have your friendship. One day I’ll make a trip to visit your group of ladies. Your sugar-free recipes are awesome. I’ve already recommended you to several friends here. What is your passion in life? My passion in life used to be eating and watching TV. Now it’s to share how God delivered me from food addiction and obesity. He will deliver others too. He’s not a God of partiality. I want to spread the word of the freedom He gives. What is the one social injustice that breaks your heart and why? I would immediately end all abortions. If a woman conceives and unable to care for a child, there’s plenty of couples seeking to adopt. I saw my first-born grandchild on an ultrasound at 12 weeks. Amazing. A teeny little person with arms, legs, and a beating heart at 12 weeks Wow! They say a woman should have control over her body. I agree, but the control should be before conception, not after. I know women who chose abortion. They say it messed up their life until they met Jesus and found peace. Now they share their story to help bring healing to others. If you could change any character trait what would it be and why? I’m working on organizational skills with time, money, and projects. Coffee or tea? Can you recall when it became a ritual in your life? If so briefly describe. I drink both. My Mother served iced sweet tea at meals and drank hot tea with sugar and milk in the mornings. Dad drank coffee. As a child at breakfast I drank hot tea with Mom. As an adult I started drinking coffee to keep me from overeating. (It didn’t work.) Now I drink coffee in the morning and sometimes hot tea at night before bed. I was granted this award by Ellie at https://newcreationsministries.wordpress.com/ She writes a beautiful blog about life, the love of God, and healthy eating. 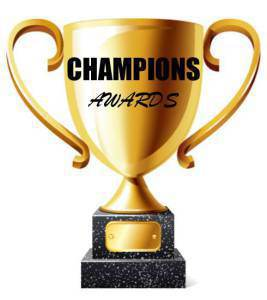 The Champions Award is a way of saying thank you to those readers and writers who go the extra mile in support of others. I know with this award we needn’t say anything special. Rules: If you choose to accept this CHAMPIONS AWARDS, it’s simple. Post this Award Sticker on your blog. Use the hashtag #CHAMPIONSAWARDS. Keep it simple… no need for explanations for the Awards… we know how great these folks are. You are free to give out these Awards as frequently as you wish. Now to list those awarding blogs. If you’re not on this list, feel free to take these awards and use as you see fit. No assignments required, just enjoy. Another award is coming from my new friend, https://lasamaritanablog.wordpress.com/ That award is for smaller blogs. 4. https://dreambigdreamoften.co/ Dray helps to create your dreams. 5. https://lasamaritanablog.wordpress.com/ My new friend. This entry was posted in Blog awards, Spirituality, Uncategorized, weight loss and tagged abortion, Blog awards, champions, friendship, losing weight, overeating. Bookmark the permalink. Congratulations on your awards. You are very deserving of them all with all the inspirations that you provide. I didn’t feel that it would be fair to take any of them as I haven’t blogged in a while. I allowed myself to become “unnecessarily busy”. I am trying to play catch up now and hope I am a lot more consistent than in the past because WordPress is one of the places where I come to relieve myself of stress through reading inspiring blogs like yours or ‘attempting’ to write a decent blog. Thank you Victoire, it is because of you and others like you that I continue. God has touched me with His delivering power. It’s amazing to me even. I don’t deserve His mercy because I am the sassiest child, but in His grace chose to set me free from my “self.” I owe Him my life and all that I am or will be. God promises to do the same for you. Thank you Debbie for the award and apologising for the late response. Please see my post at : https://susieshy45.wordpress.com/2016/04/17/sunshine-blogger-award-2/. Awww! Susie thank you. It is not me- has never been me. For some reason God has granted me mercy even though I am His sassiest child ever. Also, I have promised myself to never be this late in responding again. Thank you, dear Deborah for the nomination. I appreciate the gesture and your posts always inspires me.